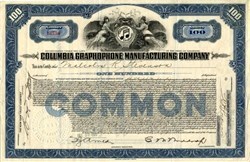 Beautifully engraved certificate from the Columbia Graphophone Manufacturing Company issued in no later than 1921. This historic document was printed by the American Banknote Company and has an ornate border around it with a vignette of two angels with the company logo. This item is hand signed by the Company’s Vice President and Assistant Treasurer and is over 85 years old. 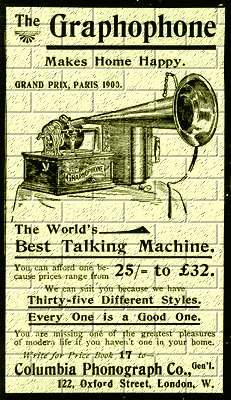 The Columbia Graphaphone Company was one of the three major companies in the early days of recording, sharing the scene with The Edison Phonograph Company and the Victor Talking Machine Company. While Columbia proved to be very active in the recording scene and remained for very years a successful company, they were not able to get out of the shadow of Edison in the early years. The company Merged into Electric & Musical Industries Ltd known as EMI on 4/20/31.